Our girlfriend Eve started this whole thing with “us” and “them”. Her life was perfect. Yet deep inside herself, she wanted her own way. James tells us that most of the fights we have with each other (including our spouses) is because of this very thing. I choose to respect my spouses’ ideas even if I disagree with them. I choose to love my spouse and do everything I can to help him or her today. 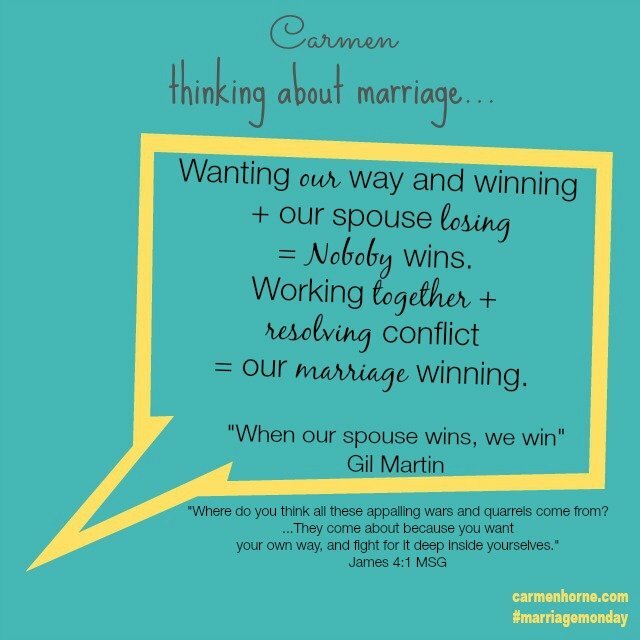 I choose to believe my spouse and I are teammates and that with God’s help, we can find solutions to our conflicts. When we look at it as though we are on the same team, we understand that our team cannot win when we work against each other. Is your marriage dying from friendly fire? This is such great advice. I love Dr. Chapman’s work a lot. Men urge to be respected and women long for love has been some of his best advice I’ve read from his books. Being a team mate with your spouse is the best way to go through life together. I agree Crystal, Dr. Chapman has helped so many of us understand how to love each other better. Thanks for visiting! Hey Renee! Thanks friend for stopping by. You encourage me! I found your link when I linked up with Sue. What a refreshing post, not too long, but straight to the point. Thank you Carmen! Welcome Carolyn! Thanks for stopping by! Perfect timing for me, friend. I needed this right now… Thanks for sharing!! Glad it encouraged you Jess! What a great mini-post, Carmen. I especially love that first point about respecting your spouses ideas. So good. I need to remember that! Just shared on FB and twitter. Thank you Betsy! I liked that point too!